If you wish to download this book, please click here to go to the download page. Collecting venomous snakes, poison arrow frogs, giant scorpions and black widow spiders is not everybody's idea of a summer holiday. Meet John and George Newmark, identical twins. They spent 25 successive holidays collecting reptiles and invertibrates from jungles and swamps, deserts and other wild and remote regions of the world. It was a hobby, and they presented their 'loot' to London Zoo after each trip - up to 3,000 creatures in all. Their book starts with them aged 5, in 1918 and contains stories right up until the mid 1980s. This book describes some of their adventures: how they found a swarm of giant rhinoceros beetles, bigger than conkers and with horns, flying around their bedroom in the middle of the night; how George found himself in the presence of a poltergeist; how John and some friends had to abandon their car when it was invaded by hordes of hungry baboons. The twins were about four when they were first taken to the Zoo. Throughout their schooldays their love of animals grew and they joined various wildlife societies. They subsequently joined the army, quickly volunteering for service overseas, and were delighted when they were posted to India where for two years they were able to further their knowledge of wildlife, watching birds, mammals, reptiles, and insects although, it must be said, they did a certain amount of soldiering too, enough to promote them to sergeant. Then came the war, separation, capture as prisoners and, eventually, peace - they arrived home within hours of each other! 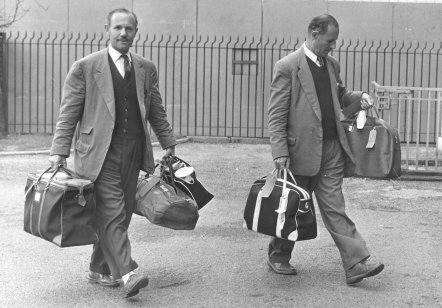 Resuming their travels as civilians, George went to Malaysia and John to Australia and Africa but in due course they returned to England and it was then that they embarked on their annual collecting trips. On one of the earliest holidays they escorted 86 members of the XYZ Club (EXceptional Young Zoologists) to game parks in Kenya and Tanzania. Four members of staff from Longon Zoo also accompanied the group to ensure that all 86 children returned safely to their homes, with stories to tell again and again. Subsequent trips frequently included a few young students especially if they were interested in wildlife - budding ornithologists, herpetologists, entomologists or other 'ologists, were offered a wonderful and practical chance to increase their knowledge of nature. This book is written by John and George Newmark, authors of "To the Zoo in a Plastic Box".